LABCOTER® 2 vacuum deposition system은 파릴렌(Parylene) 보호막 코팅을 형설하는 목적으로 디자인 되었습니다. 이 장치는 양산용 장비와 같은 원리로써 생산되었습니다. 그러나 장비의 규모에서 소형으로 제작되어서 센서, 의료기기, 유기 샘플 및 기판 코팅의 연구목적이나 PCB 수리, 소량 생산에 적합합니다. 이 시스템은 소형 엘라스토머, 플라스틱 및 페라이트코어의 코팅에 이상적인 코팅 챔버를 제공하고 있습니다. 이 장비는 80 Kg의 무게이며, 110 VAC, 20 amp에서 작동하며, 바닥면적은 60cm X 60cm입니다. 내장된 콜드트랩을 사용하여 몇가지의 냉각 방법이 가능하며 표준 사양으로써, 수동식 액체질소 공급방식, 옵션 사항으로 자동 액체질소 공급 방식 및 칠러가 있습니다. 컴퓨터로 콘트롤하는 자동 모드에서, 시스템은 공정 압력까지 자동으로 펌프다운 하며, 퍼니스가 작동 온도까지 온도를 상승시킵니다. 적당한 온도와 압력에 도달했을 때 파리렌(Parylene)이 증발하기 시작하며, 공정 작업 조건은 자동으로 모니터링 됩니다. 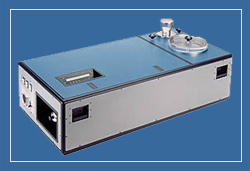 The compact and portable Model 3000 was specifically designed for processing small substrates or modules such as micro-miniature components and sensors. Its 8" X 9" stainless steel chamber also accommodates small quantities of larger parts, including prototypes for research and development applications. For more information, download our brochures 2 or contact us. The LAB TOP®parylene deposition system was designed to complement our patented high capacity and high efficiency modular line of pary-lene vapors deposition equipment. Its size allows "bench top" use when space is at a premium and its in-built handles allow the unit to be readily transported to alternate locations as desired. The unit is specifically designed for processing small substrates or modules. Alternatively, small quantities of larger parts can be accommodated in its standard 8" x 9" stainless steel chamber. manufacturers of micro-miniature components, sensors, and hybrids. to minimize frequency shifts, will appreciate this capability. RS-232 port. This option feature allows differentiating process parameters to be stored for analysis. The design provides high reliability through the use of quality components and careful workmanship. All process parts are fabricated from Electro-pol-ished stainless steel. A high grade vacuum pump and after filter permits its use in a clean room or laboratory without the need for external exhausting. The necessary maintenance is minimal and its design incorporates a hinged cover, which can be held in the open position as well as an easily removable side panels. The cover and panels provide complete access to all components, in the event service is required. design that allows complete removal of the Pyrolysis tube in minutes.